It is the grave danger of organized evil in our time. I had never heard the term “antifa” (pronounced ANT-ee-fuh) until a few months ago. It burst into the American lexicon as violent and raucous crowds battled a a white supremacist protest in Charlottesville, Virginia. Soon, it led to statues being defaced and desecrated in various states of the Union. And the consistency and impact of both violence and history-erasure seem to be growing. They are organized and orchestrated to destroy. This movement of organized evil boasts financial backing from powerful folks (like billionaire anarchist George Soros), academic sympathizers in major universities, and the “cheer leading” approval of the secular progressive mainstream media. That’s why I call it organized. These various entities didn’t have a convention and decide to wreak havoc on America’s laws and history in systematic fashion. They tapped into a mental deception–a humanist, anti-Judeo-Christian-America worldview being peddled by the demonic realm. The main conspiracy is invisible. But the Group Think on a human level is now very coordinated and growing. They shout down free speech on college campuses. They riot and destroy property when verdicts don’t go their way. They rip down monuments to our past, starting with statues of Confederate generals Robert E. Lee and Stonewall Jackson. Next in their sights, as commentator Bill O-Reilly has warned, stand George Washington, Thomas Jefferson and many other founding fathers. At the root of the violence and tearing down is a hatred of capitalist societies and a willingness to use the power of violence to overthrow laws and governments. That is the essence of a communist revolution. It was organized communism that gave us the Soviet Union, communist China, Cuba, and North Korea. Dershowitz warned there is a danger to tearing down these monuments because it creates a slippery slope regarding what is acceptable and what is not. “Of course there is a danger of going too far,” Dershowitz said. “There is a danger of removing [George] Washington and [Thomas] Jefferson and other Founding Fathers who themselves owned slaves.” He compared the movement to remove Confederate monuments to Josef Stalin, and accused the agitators of trying to rewrite history. Even Constitution-revering liberals fear organized evil in our time. And sometimes masked, evil faces. 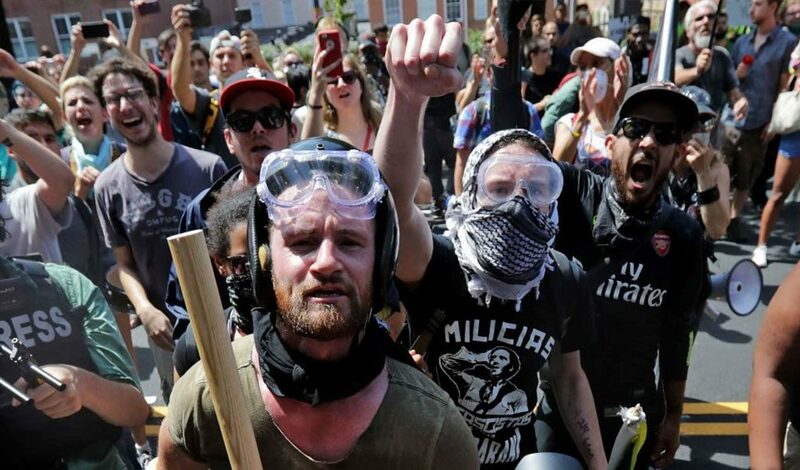 Antifa is a misnomer if there ever was one. They are the real fascists (Marxists or communists). What they are really against (due to demonic delusion) are God, faith, liberty, law, Christ and his principles for living. Slavery was defeated by a brutal civil war and courageous emancipation. Segregation was halted by peaceful protests and good laws bringing cultural change. Yet, 2017 could be the beginning of the 1984 that George Orwell envisioned. It’s just thirty years late due to the prayers of God’s people, the Reagan Revolution, and the once noble cultural character of the people. Make no mistake: In the Western world, we are facing the grave danger of organized evil in our time.